I am definitely not a chef nor do I cook very often. Being single has it's perks! But tonight I was hungry and I wanted something warm. I was not in the mood for steak or hamburger or a salad--I wanted CARBS. 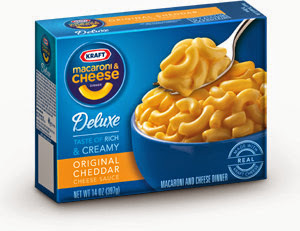 It just so happened that the other day Kraft Macaroni and Cheese Deluxe was on sale and I bought a package. Then I remembered that I had a package of Sunkist Gourmet Style Tuna-Mexican variety in my refrigerator. These come in pouches so you don't even have to drain it! Did I mention I can be a lazy cook? I made the macaroni, stirred in the packet of creamy cheese that came in the box, then added the pouch of tuna. Voila---dinner is served. I could have gotten fancy I guess and sprinkled Italian style bread crumbs over the top--or put in in the oven to bake it for a while--Nope ate it just as it was--delicious. 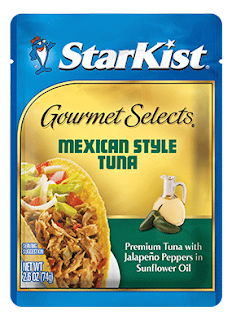 If you are cooking for a family I do suggest you use more then one pouch of the tuna! Neither Kraft or Starkist is aware of this post! I always put broccoli with Mac and Cheese. Tuna would be great too! I love mac and cheese. I do not myself like tuna. I do get creative with it sometime. I like adding taco meat, fresh tomatoes, green onions, and whatever else sounds good at the moment. I like it with broccoli too.